Defending champion Malvin Montevideo (LUB) strengthened their roster with addition of 29-year old American power forward Chris Braswell (206-107kg-89, college: Charlotte). He played recently at Al Khor in Qatari D1 league. He's replacing Fotios Lampropoulos (206-PF-83). The most of last season Braswell spent at Highlanders in Canadian NBL Canada where in 17 games he recorded 14.9ppg, 6.5rpg, 1.6apg and 1.0bpg. He also played for the Erie Bay Hawks in NBA. In only one game he averaged just 2 points, 3 rebounds and 1 assist. Two years ago (four years after he left the college) Braswell was drafted by Erie Bay Hawks (G-League) in third round (70th overall). He attended University of North Carolina - Charlotte until 2013 and it is his sixth season in pro basketball. Braswell is quite experienced player. Thanks to his pro career he managed to play on four different continents (Europe, Asia, Latin America and of course North America) in five different countries. 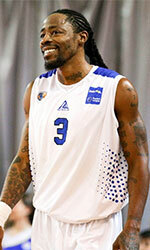 Braswell has played previously professionally in Cyprus (Apollon), Finland (Lapuan Korikobrat), Japan (Chiba Jets), Switzerland (Geneve Lions) and Uruguay (Olimpia).